This is what a children’s book should be like! I’d been really worried that Sally Nicholls couldn’t possibly write a second book to match Ways To Live Forever. It was as if Sally had been really lucky with her first, and how could she do it again? 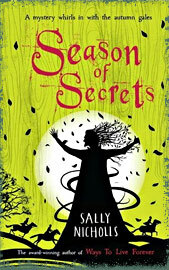 Now that I’ve read Season of Secrets, it’s clear that Sally was only practising with her first novel, because this new story is perfect. Season of Secrets is completely modern and set today, but it’s also timeless, and maybe even placeless. Sally mixes the everyday existence of two primary school age sisters, with traditional myths, and it works. Molly and Hannah have just lost their mother, and their father has lost the plot, and sent his daughters to live with his parents. Transplanted to a small village school, surrounded by the north English countryside, Molly meets her ‘Man’. He appears to be real, except Hannah can’t see him. As autumn changes to winter, Molly’s Man changes, too, and there is a battle between Molly’s Oak King and the Holly King. In their ‘normal’ lives their Dad continues to disappoint them, as he fails to get things Sorted Out. They also drive their grandparents demented with their bad behaviour, brought on by their Dad’s failings. This is a beautiful story, which makes a lot more sense than you’d think from the description of mixing myth and reality. It’s about another kind of death than Ways To Live Forever, but one that is almost more important. Losing a parent is the greatest fear children have. This entry was posted in Authors, Books, Review, Writing and tagged Sally Nicholls. Bookmark the permalink. Wonderful review! I’m looking forward to reading this book. Though I gather no. three is doing well? I have a first draft of number three. Very exciting. Now I have to leave it in a drawer for three weeks while I do admin and go and build dry-stone walls.